Over 28,000 terms clearly defined. 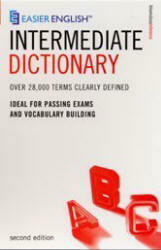 Ideal for passing exams and vocabulary building. Second Edition. - Bloomsbury Publishing PLC, 2004 - 736 pages. This dictionary contains the essential words and phrases needed for everyday communication by learners of English and information on how these words and phrases are commonly used. It builds on the Easier English™ Basic Dictionary and is especially useful for intermediate learners of all ages who are expanding their vocabulary and knowledge of English. Each main word, including compound words and phrasal verbs, has its own easy-to-find entry in bold type and a pronunciation in the International Phonetic Alphabet. The relative frequency of the most commonly used words is indicated. Common phrases, verb patterns and idioms associated with the main term are shown in bold type and separately defined within the entry.